sounds like the opening line of a novel, but The Lost Continent is the prolific writer’s first travel book, his wry view of America – published in 1990. The cover has a coffee-cup stain as part of the illustration – the detritus of the seasoned traveler. Bryson has gone on to leave his mark in his written ramblings – most recently in At Home: A Short History of Private Life (watch the book trailer on You Tube here). 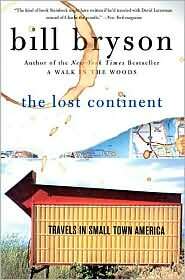 When reading The Lost Continent: Travels in Small Town America, you might be tempted to skip around – go ahead; you will still get Bryson’s flavorful asides along with his views of how the American small town is being lost to progress. As I joined Bryson on his search for the perfect American town (Amalgam), I wondered what he would think of the changes in those places now – twenty years later. A hotel room in New York’s Times Square for $100 might have been pricey in 1990, but sounds pretty cheap today.